There’s always something to do at UNT! 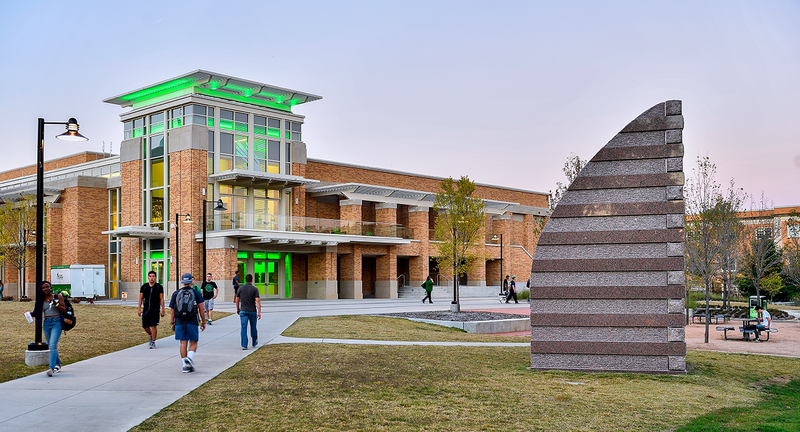 The UNT campus offers you countless options for entertainment, dining, fitness, relaxation and more! Whether you’re headed to Apogee Stadium to cheer on the Mean Green or headed to the Murchison to enjoy a free concert from the College of Music, you’ll never run out of ways to enjoy the full university experience UNT has to offer. UPC, which programs more than 180 events and activities thanks largely to the suggestions made by UNT students. The Union Art Gallery hosts a variety of student and community artists throughout each semester. It’s a great free way to check out local art on your way to class. UNT offers a long tradition of athletics, growing stronger every year. In our first year in Conference USA, our Mean Green football team won the Heart of Dallas Bowl. Since then, we've played in the Heart of Dallas a second year and the R+L Carriers New Orleans Bowl this year, building excitement and pride. 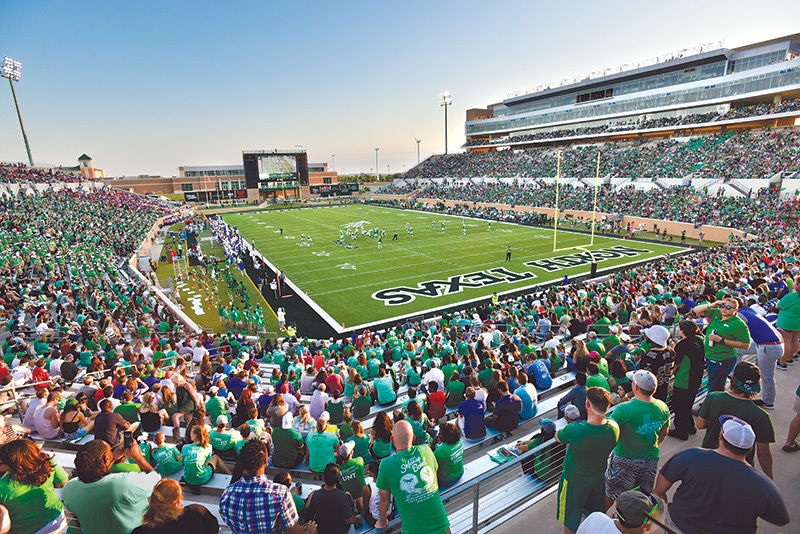 UNT’s Apogee Stadium serves as a community rallying point, bringing fans together as they cheer their hometown football team to victory. 16: UNT offers 16 sports as an NCAA Division I school — the highest and largest division among universities. 127: The Mean Green have won 127 conference championships, including 34 since 2000. SUCCESS: The Mean Green set a new record this year with a cumulative score of 83 for the NCAA Graduation Success Rate, with the tennis team scoring a perfect 100. 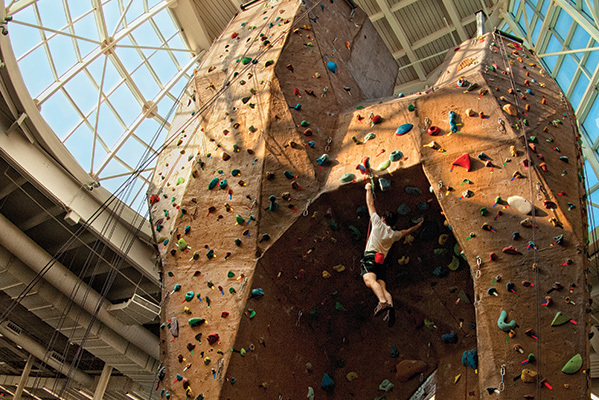 The amazing Pohl Rec Center is the best place to work off steam and stay active. Take on the 45-foot climbing wall, swim laps in the two pools or join a match in the indoor soccer gym. While you’re in the rec center, you can even sign up for camping, canoeing and hiking trips through the Outdoor Pursuits Center. Our student organizations include academic honor societies, professional development and community service organizations, cultural groups and sport clubs. And if you can’t find the club or interest you’re looking for, you can form your own student organization! At UNT, we teach green, research green and simply are green in everything we do. We offer a degree in Ecology for Environmental Science and have more than 50 courses with a sustainable focus. The campus has a robust recycling program, fuels its vehicles with biodiesel and new construction meets the highest green building standards. Learn more about how we Mean Green. You can live on campus with other transfer students in our Transfer REAL community in Legends Hall. As part of the community, you have a built-in support system and access to special events to help you make the transition to UNT. For more information, visit the Housing website. Denton has more than 100 apartment complexes, many within walking distance of campus or served by the campus shuttle system. You can access our online guide to off-campus housing or learn more about services offered for off-campus students. Many students drive to campus, which is 40 miles from Dallas and Fort Worth on Interstate 35. Parking permits are available at different rates. UNT also features 2,500 bicycle parking spaces and several bike repair stations. The Denton County Transportation Authority's A-train rail service connects Carrollton and Lewisville to downtown Denton. Bus routes, free to UNT students, connect the rail station to campus. Other services include an on-call late night shuttle, a ridesharing website and a car rental program. For more information, visit our Transportation and Parking website. UNT works hard to be a safe campus. We provide a well-lighted campus, officers on bicycles, 79 emergency call boxes, police escorts at night and an emergency contact system to notify you in case of an emergency or campus closing.